It was only a matter before Conor McGregor reacted to Artem Lobov’s thrilling, Saturday-night victory over Jason Knight at BKFC 5. 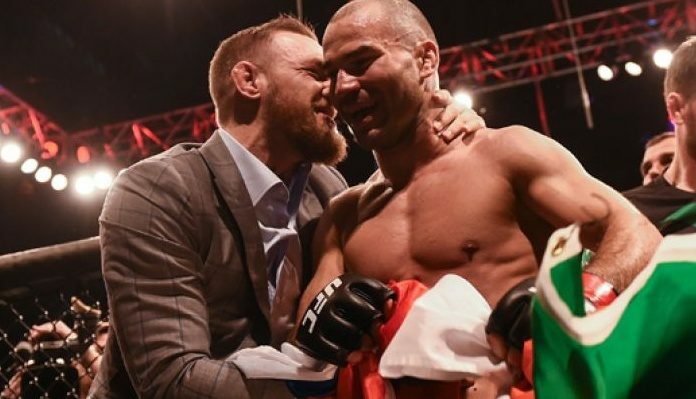 On Sunday evening, the Irish MMA superstar took to Twitter to congratulate his long-time training partner — and his foe — on this unforgettable fight. He also claimed that Lobov now deserves a new BKFC contract, and took a shot at their shared rival Paulie Malignaggi. “What an animal! Proud of you @RusHammerMMA! Amazing fight Paulie’s nice and quiet all of a sudden and that’s not like him haha We want a new contract for the @RusHammerMMA for this next bout! It has been earned and now deserved! What a great showing @Jasonthekid23. Big respect!” – Conor McGregor on Twitter. With his victory over Jason Knight, which marked a successful BKFC debut, Artem Lobov sets up a massive grudge match with the aforementioned Malignaggi. This showdown, which is far and away the biggest fight BKFC has promoted thus far, is set to go down at BKFC 6 in June. The bout will be Malignaggi’s first since a March 2017 knockout loss to Sam Eggington. He’s 36-8 as a pro boxer, but has never competed sans gloves. Conor McGregor recently ended a short-lived retirement, opening the door to a host of exciting matchups in the UFC lightweight division. While nothing is official just yet, it sounds as though he could return this summer — perhaps as soon as International Fight Week in July.